← Previous Previous post: It’s tax time! Have you considered donating to the PT Not Traffic campaign? On the subject of Protective Services Officers, both Tarneit and Wyndham Vale have a PSO pod built into their station buildings. Great news from Marcus Wong about PSOs. I was on the last UP and last DOWN, as well as the first of each on Sunday too. I stayed on the platform at Little River for I think 6 to 7 hours between trains. I do have videos and photos of three of those trips if Daniel Bowen wants me to post them. The RRL is a mixed bag. The negatives is ofcourse the now broken link between Werribee and Little River. How hard would it be for PTV to source a sprinter railcar for operating a shuttle link ovee that route? Also, the fact that all Geelong trains must service both Tarneit and Whyndamvale is beyond me. Why do we not have a regular suburban shuttle all day long. Say, use the H sets for that. Yet it gets worse. It is beyond me how you would want to have Warnambool trains used for travel between Tarneit and Southern Cross. 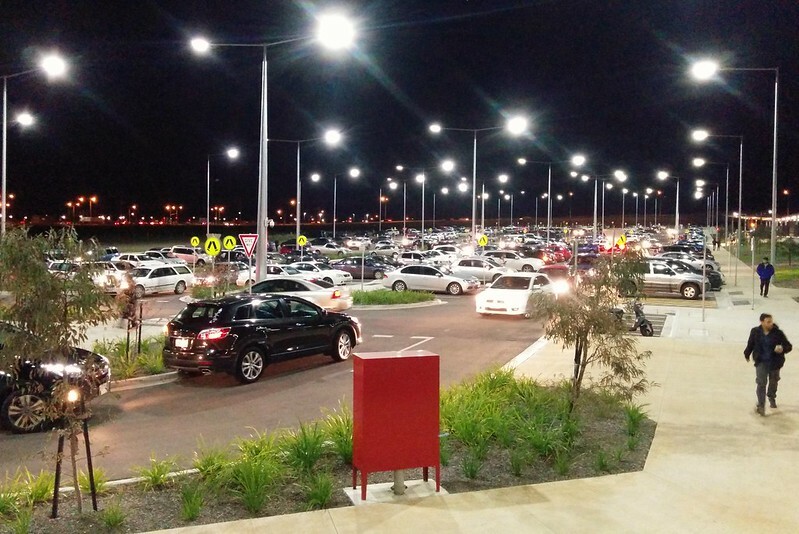 It is bad enough they permit Southern Cross to Geelong now they have a 20 minute service just for themselves. 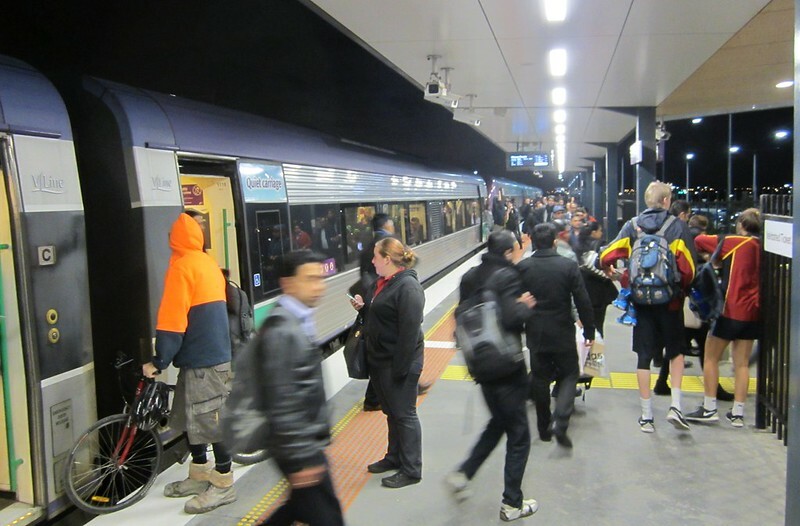 At the same time, the same thing, to Bairnsdale and Swan Hill are now denied to persons boarding at Pakenham and Sunbury respectively, and they have much longer to travel than Tarneit. On the other side, there is no doubt that the RRL is a massive advantage to Geelong customers, being given the chance to have a 20 minute service, as well as having an express run without stoppers getting in the way. Ballarat and Bendigo lines also benefit from that somewhat. 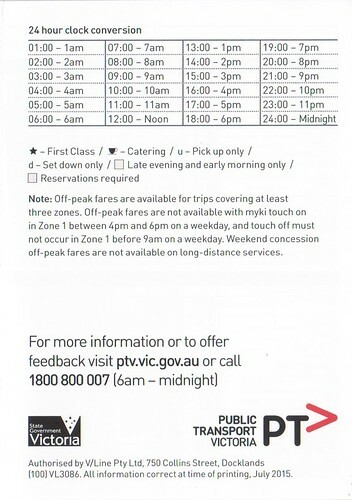 A couple of years ago I raised with V/Line the ridiculous inconsistency with which it uses the 24-hour clock. Despite being told it was a personal bugbear of the staffer I spoke to, nothing has changed, and it makes for confusion. On departure boards shared by V/Line & Metro, the former has a 24-hour clock and the latter a 12-hour one. V/Line uses the 24-hour clock on its station clocks and on timetables, but conductors still exclusively use the 12-hour clock. Even more weirdly, station PIDS are inconsistent. 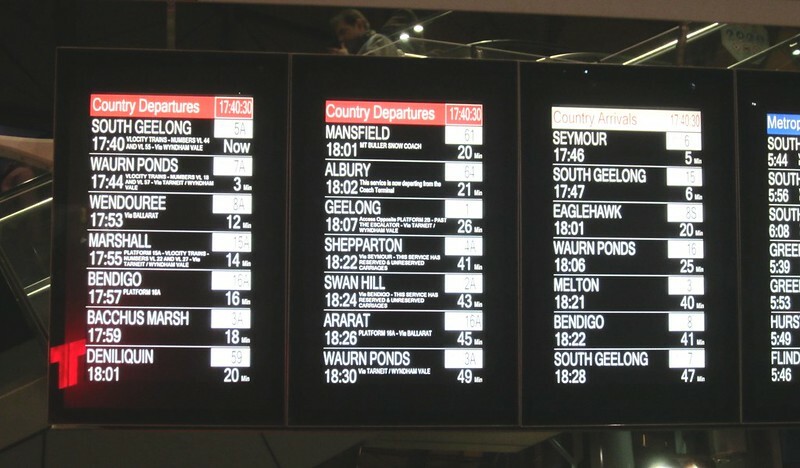 On the Geelong line, the dot matrix “next train” displays are in 24-hour time, but as your photo shows, that doesn’t seem to apply to the newer screens – so they have actually gone backwards to some extent. 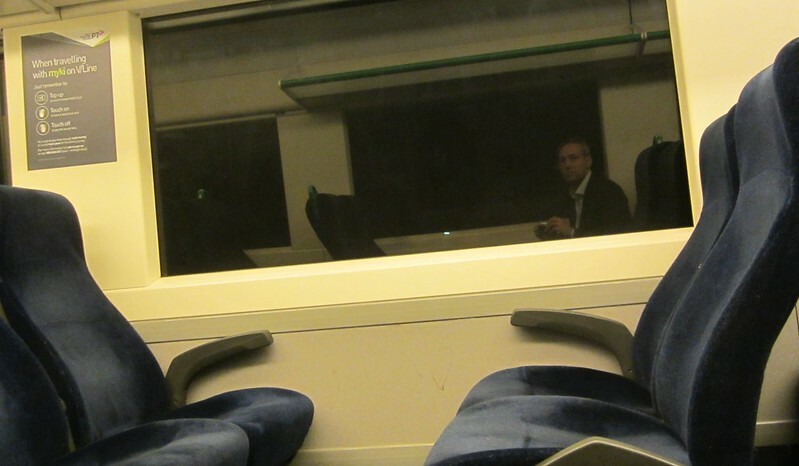 V/Line regularly surveys its customers about 24hr or 12hr timetables. Unequivocally, the results are in favour of 24-hour times. 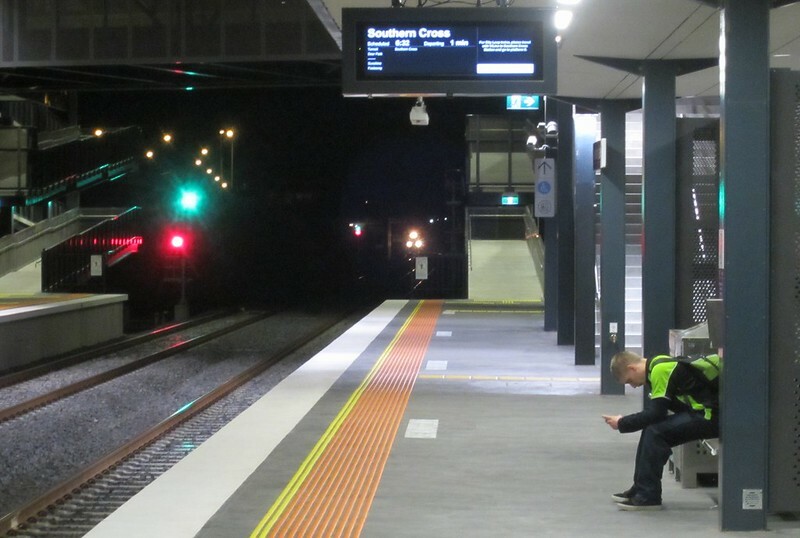 If V/Line passengers are unequivocally in favour of using the 24-hour clock, then V/Line should move with all possible speed to make it the only clock used on its services. It’s mystifying why that hasn’t been done already. Then maybe PTV can ensure that Metro and Yarra Trams to do the same. I know 24 hour time very well but I still convert it to 12 hour time. 24 hour time is probably better for timetables for me but I doubt it is for most people and I am astonished at the survey results mentioned above, to the point of disbelief. Transport for NSW uses it for all modes online, but it appears not in their printed material. Amusing in Brisbane, Translink uses 12-hour time but private airport rail line company Air Train uses 24-hour. Some people with intellectual disability also found the use of the 24 hour clock too complex and difficult to understand. You’ve hit one of my hotbuttons with the 24hr time. I live on the Frankston line south of Cheltenham, so having a timetable with me is of great use, letting me time my trip home for the fast trains. I have the PDF timetable on my iPhone (PTV’s app got terrible reviews in the App Store, so I never tried it). That uses 12 hour times, with afternoon distinguished by bold. Unfortunately, when looking at it on the iPhone’s small screen bold isn’t always immediately obvious if there’s no non-bold on the screen. This can mean a lot of scrolling around. 24 hour time would make this a lot simpler for me. Those PDFs are generated dynamically on PTV’s web site. At this point, it’s just stubbornness on their part not to have a 12hr/24hr option when downloading a timetable. It’s not ignorance – I did make the suggestion to them years ago. As you say, most people have met 24 hour time before. But even if you never had, what else could a time of 16:18 be but 4:18 pm? There is a good argument for supporting 24 hour time only, like almost every other railway in the world (including London’s). On the 24 hour time issue, They need to be consistent. I prefer the 24 hour clock, especially for longer range services such as V/Line where routes are long, and services are infrequent. But, it does need to be consistent. I constantly need to convert between the two, and when I am tired from a long day, it becomes hard to do. Even better would be to have both time types. On electronic time displays, have the hour alternate say each 30 seconds between 12 and 24 hour. @Francis E, the new PTV is better than the first couple of versions, I’d give it a go again. But yes, a 12/24 hour toggle in an app, or on the PTV website, would seem pretty simple to implement. Transport for NSW moved to 24 hour time in October 2013. The timetable you link to, Daniel, predates the move. They have not updated all the .pdf timetables for the STA run buses but I think all the private operators and other modes have made the switch.